KENKI DRYER has three main characteristics. They are 1) Any materials can be dried as expected including sticky, adhesive and viscous materials and raw material slurry that no other company can deal with, 2) dried material can by recycled or utilized as raw materials because of its low-temperature drying method, and 3) there is no need to assign operator since its continuous operating system makes 24 hours unattended operation possible. Because KENKI DRYER which is designed and built based on International Patented Technology has both outstanding abilities and simple structure at the same time, it hardly break, it has small number of replacement parts, it is easy to maintain, and it has long service life. For sludge drying, estimated time taken to retrieve cost of dryer by reducing cost of industrial waste disposal is about 2 – 3 years, and for raw material slurry drying, we recommend to replace box shaped compartment tray dryer which needs laborious works of manual operation. Also, why don’t you consider to selling or recycling wastes with high moisture contents such as used tea leaves, soy pulps, food residues and livestock excretions while our low-temperature drying method hardly change components of the materials. It prevents change in material component by drying with low temperature.The running cost is kept minimum by low-temperature drying. It can dry any sticky or adhesive materials without being clogged in the machine by using unique patented self-cleaning screws. It can achieve 24-hour unattended operation and no arrangement of operator is necessary. As residence time of materials inside of the dryer can be adjusted by changing rotation speed of shafts, moisture content can also be adjusted. KENKI DRYER can take care various purposes of drying. Because of low-temperature drying, the material components are not change.The dried material can be used for various purposes. Organic wastes with high moisture contents can be uses as fertilizer after being dried by KENKI DRYER.However, registration to each prefecture as “dried cell fertilizer“ is necessary in case of using the dried sludge as fertilizer. Component of dried cell fertilizer is prescribed in Fertilizer Regulation Act and it is necessary that the component fulfill the regulation.Also, plants harms tests must be done and expected harms are investigated by these tests. Previously, components of sludge dried by KENKI DRYER have been inspected to be registered as “dried cell fertilizer”. As the result of the inspection, there was no problem at all.We recently have got a result of another inspection and the components are within the provisions as well. So, what are reasons to make fertilizer even by introducing dryer? ・Reduction in cost of industrial waste disposal and cost of management such as industrial waste manifesto system. ・ Improving environmental hygiene by drying sludge immediately. ・ Contribution for reducing environmental impact. Showing up corporate visions to public. MLIT (Ministry of Land, Infrastructure, Transport and Tourism) established JIS standard about sewage sludge solid fuel in September, 2014. There was a purpose to improve recycling rate and energy generation rate of sewage sludge since solid fuel made from sewage sludge has 60-70% of calorific value compared with coals and it is enough to be used as fuel. 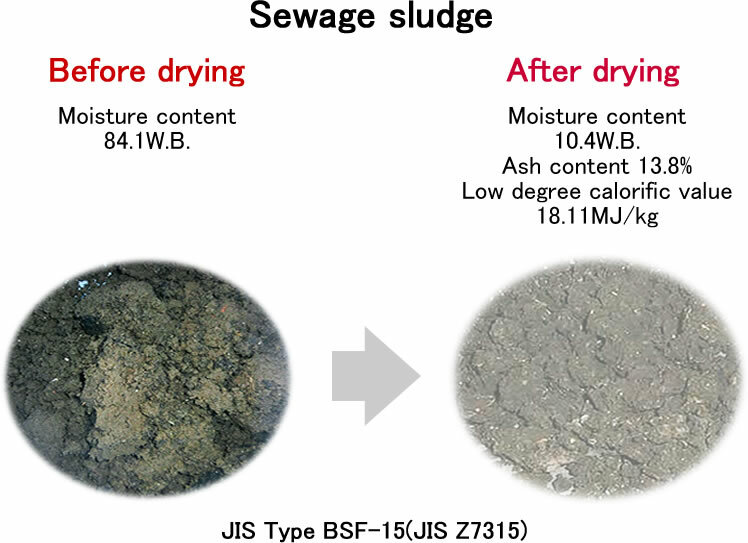 Establishment of JIS standard helps stabilization of quality, establishing reliability and stimulation of market about the solid fuel made from sewage sludge. According to cabinet decision in March 2012, target energy generation ratio of sewage sludge is set to be increased to 29% in 2016 from 13% which is the actual result in 2010. Data of KENKI DRYER, which is our drying machine, about sewage sludge before and after drying is the following. These are examples in Japan. There is stench remained after drying process of sewage sludge using KENKI DRYER. One of the method to remove the stench is low-temperature carbonization and it can be done by a pyrolyzer called Biogreen which is one of our products.